Little late on my weekly blog post for last week but a bunch of new stuff has been done. Make a better polished video, it was my first time making a promo video and it wasn't the most polished so it probably didn't grab people's attention enough. Better explain some of the features of the game in the press release. That said, I don't know if I'll get a better response over the next week, I'm hoping to get reviewed by at least a medium site, so that I can start to get known. It's the beginning of a long journey to getting recognized as an up and coming indie dev. Anyway, I'm not discouraged, just pondering how it could have gone better. I've read a lot about marketing but experience is the best teacher. So about the game: I've been working on the Custom Map Editor. I've got the map creation finished. And I've got the loading capability and editing capability added, all that's left is to actually make the maps from the map file and create the waves. This will be the difficult part. I have the data all there exactly how I want it but now I need to put it all into action and tune the wave creation process (that's the actual hard part). 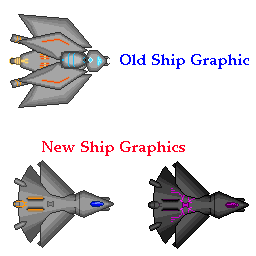 Also, I just made a new player ship graphic. The old one just didn't look ALL that great. I'll probably be streamlining my graphics and updating some of the older stuff until the game is released. I'm trying to rework graphics to keep them similar thematically (such as buttons, etc). Or at least have thematic groups (to avoid monotony in graphics). The new Ghost Mode looks a lot better than the old one and it fits a bit better with the enemy graphics. The old ship model was too pastel compared to everything else. I may rework some of the enemy graphics and turret graphics as well but they're less of a concern than the player ship. The reason you have ghost mode (secret lore tidbit) is because you have Fuscian Powered tech on your ship. There won't be any story secrets within THIS game, but part of the Fuscian back story (if you play SBX [Space Blaster X]) is that Fuscian energy was discovered and humans attempted to harness it's immense power by fusing it with various alien lifeforms. But it got out of hand and Fuscian Parasites started taking over machines and other lifeforms. Yadda yadda, you have to go save the galaxy, that's the first game. SBX:Invasion is kind of a side story separate from the lore. But anyway, that's why you have the Fuscian Tech on your ship.